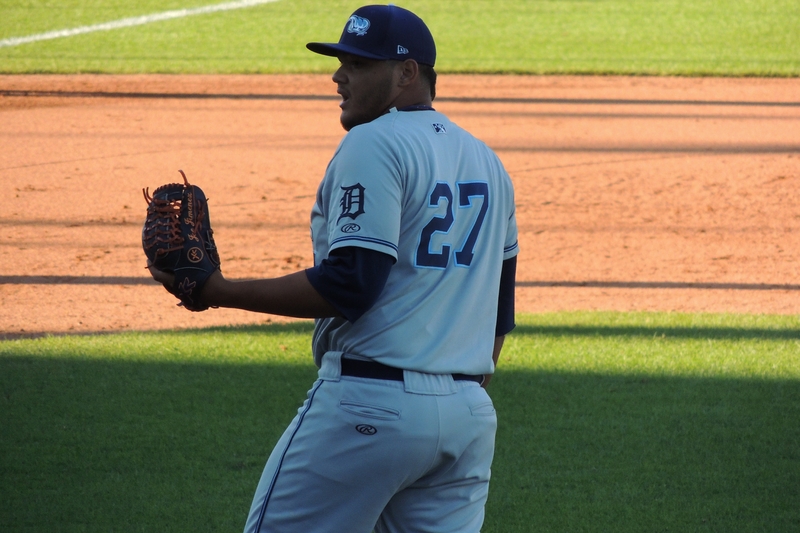 Former West Michigan Whitecaps closer Joe Jimenez made his major-league debut for the Detroit Tigers on Thursday, pitching a 1-2-3 9th inning against the Minnesota Twins. He earned his first big-league strikeout when he got Byron Buxton swinging to end the game. Jimenez didn’t get to celebrate his successful debut long before he learned he was being sent back down to Triple-A. He was told the news when he entered the clubhouse after the game. The 22-year-old reliever certainly is expected to return to the major-league level — probably before the end of the season — but the Tigers are taking things slow with their possible closer of the future. Jimenez pitched for the Whitecaps in 2015, going 5-1 with a 1.47 ERA, 17 saves, 61 strikeouts and 11 walks in 43 innings during the regular season. He was on the mound when the Whitecaps won the Midwest League Championship Series that year. He pitched at three different levels in 2016, cumulatively posting a 1.51 ERA, 30 saves and 78 strikeouts while walking 17 batters in 53.2 innings. This entry was posted in 2015 Playoffs, Midwest League, West Michigan Whitecaps. Bookmark the permalink.